Having met the pilot in command (PIC) minimums to fly the club's Open Cirrus sailplane, I'd wanted to get checked out in it for the past couple of months. After watching several Cirri compete in The Sun Ship Game--a film that everyone should see--I set a goal to fly it this season. The weather was right yesterday and the instructor on duty took the time to ensure that I had assembled it properly, provided some much-appreciated insight into her flight characteristics, then gave me the requisite logbook endorsements. With a book maximum L/D of 44:1 (for comparison, a Cessna 172's glide ratio is at best about 9:1), the Cirrus is the highest performing glider that I can rent from the club. 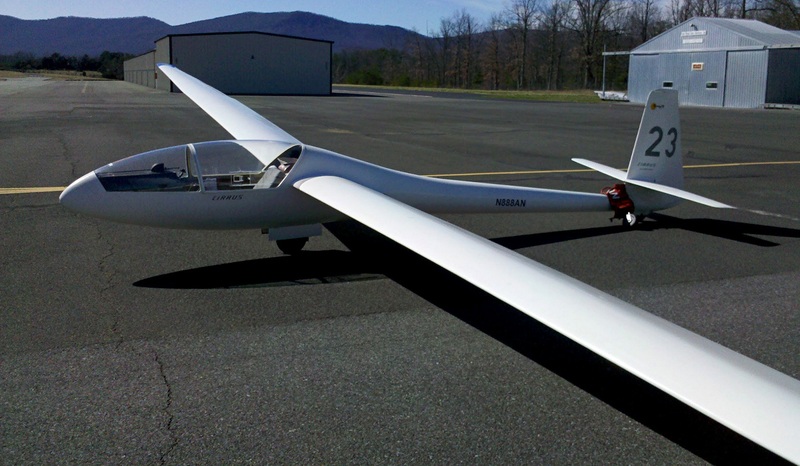 It is a classic aircraft, Shempp-Hirth's first glass glider (read the original review from the July 1967 issue of Soaring, page 18, if you're curious). It has a retractable landing gear and a center of gravity (CG) tow hook, neither of which I had experience flying. I'd also never flown an aircraft with an Experimental category airworthiness certificate as pilot-in-command. The Cirrus is flown in a more reclined position than I am accustomed, and it was clearly designed for someone taller than me. The pilot sits in a canvas sling that can be adjusted via the roller at the top. With the sling ratcheted tight and rudder pedals adjusted full rearward, I can just barely get full rudder extension. I was warned that the landing gear requires some finesse to retract, so I strapped in and practiced actuating it several times before taking the glider off of the fuselage dolly. It took several tries before I could get it to reliably lock in the retracted position. I had anticipated the glider's desire to pitch-up on takeoff, but when the ship was ready to fly, it really wanted to fly. I needed a much bigger push than expected to keep from ballooning above the tow plane. After talking to a club member who watched the takeoff (you get used to the ever-present audience in a glider operation), the resulting pitch oscillation didn't look as dramatic as it felt. And the Cirrus is a bit more slippery than anything I've flown before; even a slight pitch change would cause it to speed up and slacken the tow rope. Once off tow, I raised the gear and got it to lock on the first try. It was much easier to operate in the air than on the ground. The Cirrus flies beautifully; it is quiet and graceful. It climbed in weak thermals even better than the Schweizer 1-36 that I thought was unbeatable on a weak thermal day. At the minimum sink speed of 39 knots in reasonably still air, I had to tap the altimeter to make sure it wasn't stuck. At the maximum glide speed of 46 knots, I was still compelled to tap the altimeter in disbelief. The performance is a noticeable step above anything I'd flown before. I lucked into a thermal that punched through the inversion that capped off the lift and it carried the glider to about 5,300 feet MSL. After fooling around for a little more than an hour, I decided to land because I had forgotten water and wanted to be sharp for the first landing. I circled lazily in the predictable sink northwest of the airport to get down, and extended the landing gear at about 2,000 feet AGL to make sure that I could get it locked. I checked the gear at least 5 more times before committing to landing. The windsock didn't tell the whole story and the quartering tailwind for runway 28 was stronger aloft than I had anticipated. The wind had slackened and reversed around noon. It is an ordeal for the glider operation to change runway ends, but we will do that if a tailwind becomes unacceptable. These wind conditions were tolerable, and I usually prefer to land with a bit of a tailwind than to land against traffic. As I watched my aim point on final approach begin to slide beneath the nose with the dive brakes completely extended, I took a moment to see how well the Cirrus slipped (I wasn't prepared to use the European dive-bomb-with-airbrakes technique on this flight). I resigned to landing a bit long and focused on getting it straight and on the runway centerline. I was pretty happy with the touchdown, but I couldn't get it stopped until 100 feet beyond the usual midfield taxiway intersection. That bummed me out until I watched someone do the exact same thing a few minutes later. Disassembly took about four times longer than it should. It is one thing to watch and help someone do it, but quite another to do it yourself for the first time. I wanted to be sure that nothing got dinged in the process and solicited help.